Sorry about the dearth of posts lately - sometimes work stops play. In the meantime a spot of commuting has enabled me to catch up on some reading. I was lent this one by E of Stoke Newington, herself a woodland management aficionado, and the owner of that cool hut The Northern Monkey and myself use as a base for our Tree Rabbit hunting. The book is pretty blog-ish it reads like someone's diary that's been edited by someone else, which is what it is. 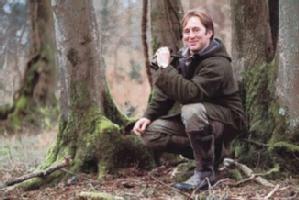 The premiss is a simple one - a chap works in woodland management and spends a lot of time alone in the woods with his rifle stalking Roe and Fallow deer. It's such a fulfilling job that at one point he reveals that he actually has a permission where he leaves his employers rifle at home and takes his own to sit in a high seat for shits and giggles outside of work time. That's it in a nutshell; he REALLY loves his job and as he's been doing it a while has a hooj knowledge of the flora and fauna of the woodlands he 'works' in. Lucky fella. "I work with nature and I appreciate that every forest block is different. When considering a cull, I'll often look at the brambles in the rides because they are of use to butterflies and dormice. When the weather is hard, deer can eat all the brambles, and this is an instance when they have to be controlled. Personally, if it was me putting the book together, I would have interviewed him to gain a bit more detail about some of the things that happen over the year. I always got the sense I was reading someone's diary, rather than being told a story. Which in fairness I was, shame though, as I think he has more to tell. As usual with the actual pros there's none of the rifle fetish of the bloggers and weekend woodsman, I don't think he ever mentioned the brand of rifle or calibre he uses once, but he is very keen on a pair of boots he has. After all dead is dead, but dry feet are really something to be exited by. Along with his forestry, and deer management duties he also has to take the odd paying client out stalking, and here the book give us an amusing insight into a mind of a calm solitary man having his peaceful day invaded by a German loudmouth with a trophy fixation. Today I am god. The client even attempts to kiss me............For the next twenty minutes my ears hurt with the bragging of what a great hunter he is. It seems to slip his mind that the poor old buck was standing twenty meters away from him. I almost say, but hold back, that shooting a medal buck is no different from shooting a doe, and it certainly doesn't make you a better stalker."